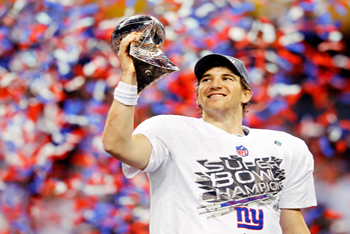 Super Bowl XLVI belongs to the New York Giants after they stuck it to the New England Patriots… again. It was a rematch of Super Bowl XLII and this year had a very similar result: Eli Manning sneaking the Giants into the lead late in the game giving Tom Brady no chance for his third Super Bowl victory. It was a great game! Both quarterbacks had outstanding performances. Eli made exciting plays in tough circumstances and Tom was completing pass after pass after pass, setting a new Super Bowl record for most consecutive passes in a row… 16!!! But Tom won’t set the record for most Super Bowl MVPs won by a quarterback, which he would have received had he won the game. Was it his last chance? Probably not, even for Eli. These two quarterbacks are both young and have many years ahead of them. You can count on at least one of them to see Super Bowl MVP nominations again. The halftime show was sung by Madonna, who proved that you can still rock it in your 50s, but maybe not on the bleachers. This diva was looking pretty hot for her age and she even sang a new song that sounded like she was still a teenager. Some guy was bouncing on a tightrope at one point in her act… that was pretty amazing. The turning point in the game came when the Patriots were winning 17-9 and driving to score again, but all of a sudden Tom got too impatient and tried to throw a 50 yard hail mary for another touchdown… it was intercepted. After that, Eli drove the Giants three times for scores to overcome the deficit. The strangest play of the game came when the Giants scored their last touchdown to take the lead with one minute left to go. New England head coach Bill Belichick decided to tell his players to let the Giants score. Ahmad Bradshaw, running back for the Giants, took the handoff and literally walked into the end zone not knowing if he should cross the goal line or not. He scored with 57 seconds left and it game the Patriots a chance to get the ball back and try to retake the lead on the last possession of the game… didn’t happen. There were so many exciting plays that could have changed the outcome of this game, but it’s now in the history books… the New York Giants are four-time Super Bowl Champions and Eli Manning is the MVP! Who did you cheer for during the Super Bowl? Let us know who you think was the best team in the comments below. 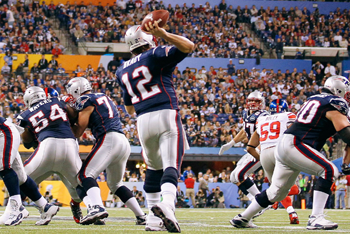 Are the 2007 Patriots the Best NFL Team Ever? Yes. They are better than the 1972 Dolphins. No. The 1972 Dolphins are way better. Maybe. It is too close to tell.